Welcome to my first weekly draft report! Drafting is my favorite thing to do, both in Magic and Eternal, so I wanted to do a weekly roundup of the sweet decks I’ve drafted, along with my impressions of the format. I got a bit of a late start on this format, on account of being in Antarctica when it was released. I got home a little over a week ago, but I was slow to fire up the draft queues. Ixalan was, shall we say, not my favorite format. Not because I was bad at it; my win-rate in Ixalan was about the same as any recent draft format. I just dislike any format where interaction is so nonexistent. Fast formats don’t bother me, though I am a man who likes to durdle around and cast 7-mana spells. Still, I enjoy fast formats so long as there are good ways to interact. And I do count blocking as interaction. The last two large-set formats have been very low on interaction, with lots of ways to punish blocking. Amonkhet had exert creatures and lots of tokens, but Ixalan went even deeper. For one, the very playable hexproof common in Jade Guardian was a miserable beating when the opponent stacked auras on it. That alone isn’t enough to break a format, though. If you put that creature in most sets, it would just be a cute deck that could sometimes spike a draft pod. Ixalan’s problem was that Jade Guardian was just another creature in this set. It almost didn’t matter that it had hexproof. You could stack One With the Wind and Mark of the Vampire on literally anything because there was so little playable interaction that could punish you. All in all, too many games devolved into each player essentially just tossing their hand onto the table and seeing who could count to 20 faster, two ships passing in the night. Enough about Ixalan, though. Rivals is here to fix everything, right? Hey guys! I’m so excited to be…why are you all looking at me like that? Yeah, black got cut hard. After pack 1, I had only Dusk Legion Zealot and a Vampire Revenant to show for black cards. What I did have was a pile of Exultant Skymarchers. When Innistrad flashbacks come back around, you’ll see how much I love me a Chapel Geist, and this one has a very relevant tribe to boot. I picked up on a few mediocre green cards toward the end of pack 1, including a Plummet that tabled 13th pick or so, which is a sign that nobody around is in green, since it’s a very good sideboard card to pick up on the wheel. Early in pack 2, I picked up Atzocan Seer, along with an Evolving Wilds and a couple dual lands. At this point I was solidly into G/W, with the idea of splashing the Tetzimoc off all my duals. Double-color splashing is ambitious, but the final deck was able to reliably hit BB by turn 6. After first-picking a Merfolk Branchwalker, getting passed a Sanctum Seeker in pack 3 showed me visions of the vampire deck that could have been. I counted my black cards, desperately looking for that magic number. I took Anointed Deacon and followed up with a pair of Skyblade of the Legion. Alas, the black was not quite there. I did wind up playing the Deacon because it’s just too strong with my five flying Vamps, and Sanctum Seeker even came in off the bench once because I needed ways to gain life against early pressure. That may have been wrong, but, as you will learn, I am a greed monster. I made it to 6. Round 2, I ran into an aggressive black-white deck that appeared to be splashing blue for a single Siren’s Ruse. Maybe there was something else, but that’s all I saw in three games. Game 1, my opponent managed to land a Raiders’ Wake that put me at 2. Thanks to a timely Moment of Triumph, I stabilized the board to a point where I could empty my hand and not be dead to any old attack, but eventually they out-topdecked me and were able to get around my blockers for the last 2 points. This is where I brought in the Sanctum Seeker. Game 2 I didn’t need it, as I had the ol’ Skymarcher into Hunt the Weak curve again, and my opponent graciously helped me out with a Dire Fleet Ravager. A flurry of pump spells finished them off. Once again, Daddy (Mommy?) Tetzimoc made an appearance for the decider. I had a brick wall of Skyblade of the Legion wearing Squire’s Devotion, along with some other dorks. I drew Tetzimoc on turn 7 and just hung out tossing prey counters around until I was able to straight Plague Wind them. My round 3 opponent had a pretty nice blue-green deck full of Merfolk Mistbinders and Silvergill Adepts. Tetzimoc is apparently fond of sashimi and showed up early both games. So I started out this format riding high with a 3-0. And with a fairly slow deck, by Ixalan standards. 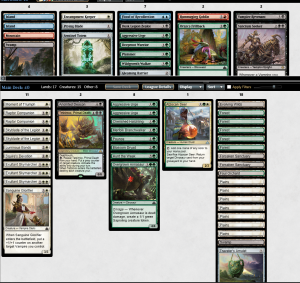 I did have a lot of X/3 creatures, which actually let me block things. And Tetzimoc put me (gently) onto his/her very spiky shoulders in several games. So I can’t make any major assessments other than Tetzimoc is bah-roken. But we all knew that already. This draft showcases why we pick removal at a premium and fill in the random creatures later. I started out with two copies of Bombard and a Luminous Bonds. I didn’t consider myself locked into , but nothing else jumped out at me, so I rode the Boros train all the way to the station. Early in pack 2, I picked up the Path of Mettle, which was surprisingly easy to trigger (shoutout to Mogg Not-So-Fantastic, Mr. Fanatical Firebrand). It also has a neat little interaction with Needletooth Raptor (another shoutout to Dr. Firebrand there, too). At the end of it, I had a pile of bad creatures, combat tricks, and five nice removal spells (plus the Raptor). As it turns out, nobody knows what the hell Metzali, Tower of Triumph[card] does on the back side. Every time I flipped it, somebody attacked their big huge beater into the second ability. Round 1, I faced a blue-black tempo-style deck. Game 1 my opponent nearly stabilized with an [card]Air Elemental, but I was able to sneak in just enough to put them to 2, and cold to my newly-drawn Frilled Deathspitter. Game 2, I had the nuts Path of Mettle hand, but drew 5 mountains. It was a close game, but eventually I died with a hand full of Pious Interdictions and Path of Mettle. Game 3, my opponent put a One with the Wind onto a Siren Stormtamer and elected to try to race the RW aggro deck. That was not smart. I cleaned it up with an Ascended Storm Fleet Swashbuckler picking up a Sure Strike. 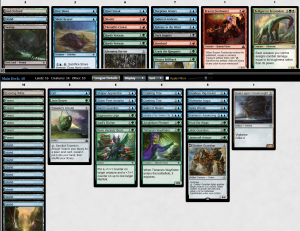 Round 2, my opponent had a siiiiiick merfolk deck. Game 1, I put them to 1 life, then sat and sat and sat and eventually found one of my two remaining Firebrands. Game 2 I got the shame scoop after they attacked their 8/7 Forerunner of the Heralds into my Metzali, Tower of Triumph. Whoopsie. Round 3 didn’t go as planned. I lost game 1 to Deeproot Waters going off. Game 2, my opponent played a Merfolk Branchwalker that stayed as a 2/1. On my turn 3, I had the option to play Path of Mettle to get the free kill on the Branchwalker or develop my board with Emissary of Sunrise. I went for the more efficient play and got savagely punished. First they played Hadana’s Climb, putting one counter on Branchwalker. I untapped, played my Needletooth Raptor, and felt pretty good about things. Next turn I was going to play Path and get the Needletooth trigger to off the Branchwalker before the Climb flipped. And then my opponent got super aggro with One with the Wind on the Branchwalker, leaving 2 mana up. I ate my 6 damage, untapped, and slammed my Path of Mettle. Because of the Path ping, I was safe from one of the two copies Aggressive Urge I’d seen in game 1. They had Dive Down instead. I took 14 on turn 5 from the 7/6 Branchwalker getting targeted by the flipped Draft 3: Blue-Green Kinda-Folk? This was a weird draft. I once again first-picked a [card]Bombard">Winged Temple of Orazca[.card]. Ow. 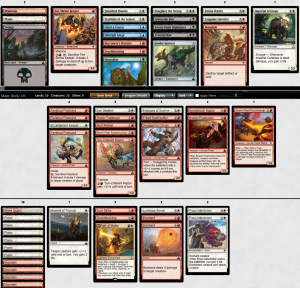 2-1 seemed about right for this deck, though I would not have been surprised to go 1-2. The deck had some cool interactions with Needletooth Raptor, and Path of Mettle was easily flippable, but that’s just two cards in a deck with zero card drawing effects. Most of my creatures were pretty terrible, and they had no synergy beyond the Raptor stuff. I lost to a deck that was doing powerful, synergistic things, though I did beat my round-2 Merfolk opponent. I did squeak out game 1, then flip my sweet rare and get ’em in game 2. It felt like I easily could/should have lost that match-up, too. Just goes to show that any creature can be a hero when it’s backed up by a fistful of removal. This was a weird draft. I once again first-picked a [card]Bombard. I followed up with a Hunt the Weak, then a few green cards, but red was getting cut. I did pick up Golden Guardian around fourth or so. Curious about how the card was, I took it. I got two laaaaaaate copies of Crashing Tide and decided to move in on Merfolk. 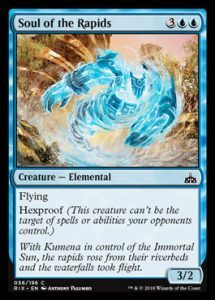 Never saw a Mistbinder, sadly, but I did pick up Kumena’s Awakening, another rare I wanted to try out. Ixalan was fairly mediocre for me. I picked up a few mediocre playables. Dusk Legion Dreadnought was something I was unsure of playing, but I figured it was a nice combo with Golden Guardian. It’s possible I misbuilt this one and should have been playing River Sneak and Deeproot Waters. I was a little light on 2s, but River Sneak blocks so poorly for a deck that wants to be playing cards like Secrets of the Golden City and Kumena’s Awakening, and Deeproot Waters didn’t seem quite good enough with only 9 Merfolk left in the deck. I did pick up the HOT HOT COMBO of Induced Amnesia + Release to the Wind, but I did not have the courage to try to assemble that contraption in this particular deck. Maybe if I’d had a way to kill/bounce the Amnesia on the rebound. Round 1 Game 1, we both stumbled on lands. My opponent was able to back up a Shaper Apprentice and a Spire Winder with enough removal to get there before I got Golden Guardian online. Game 2, my opponent conceded way early at 20 life. Maybe it was a shame concession when they attacked Jade Guardian into my active Gold-Forge Garrison, but they had a Soul of the Rapids that was currently unchecked. I had a Crashing Tide and a Riverwise Augur in hand, so I was probably going to be able to find a way to block that thing and take over with my golems, but I think they definitely were not dead. Game 3, I was able to Ascend a Spire Winder and bounce/pump my way through anything that tried to stop me. Round 2, I got my comeuppance for my first draft, as Tetzimoc (who clearly does love raw fish) showed up both games. I never had a chance. Substitute Tetzimoc for just about any other card in the set, though, and I think I can win that matchup. I felt like I had the edge in the other 39 cards. Round 3, I played against a GW dinosaur deck that was playing swamps. I spent the whole time certain that I was going to see the dreaded “Tetzimoc, Primal Death has entered the revealed card zone.” Fortunately, that never happened. I took down game 1 with the ol’ golem factory. Game 2 got a little dicey as the board stalled out. I had an active Kumena’s Awakening and had a hard time finding a flying creature or Golden Guardian. I eventually did find Shaper Apprentice and Spire Winder in time to kill my opponent with 2 cards left in my library. This deck did feel a little clunky. I was overloaded on 4s. I definitely should have cut the Jadecraft Artisan for a 2- or 3-drop. I did that after sideboarding in most rounds. Orazca Frillback came in off the bench and blocked very well against beefier creatures, and tried valiantly to race my opponent’s Tetzimoc in round 2. It did feel real nice to play a Riverwise Augur followed by Evolving Wilds. I think good mana fixing is already a high pick, but I will snap up any and all shuffle effects if I have an Augur or two. Golden Guardian might just be a trap. I misread the card at first, thinking it was 2 mana to activate on the back side. 4 mana means that you often won’t get to do anything else if you make a 4/4. Fantastic in a longer game, obviously, but if you’re getting beaten down by flying creatures, it’s not very useful. If the activation was slightly cheaper, you could both play some sort of kill spell or blocker AND make a golem, and then you’re cooking with gas. Flipping it will usually cost you not just the 4/4 body, but also another creature, or even two. It’s rare that your opponent will make an attack that lets you flip it unless they think they can race the factory. If you’re in the market for a 4/4 for 4 with Defender, by all means, play it. Or if you have a lot of 5/5s floating around, go for it. But I found it a little clunky in most matchups. Not something I’ll take too highly in the future. 7-2 is a solid way to start the format. I drafted a good mix of colors and archetypes. The format definitely felt slower. I can’t imagine playing a card like Secrets of the Golden City or Kumena’s Awakening in triple-Ixalan. I saw a lot of Merfolk decks, and they all looked really, really good when they had a Mistbinder in play. I wasn’t super impressed by any of the other decks I ran into, nor was I that impressed with any of my own. Certainly none had any of the punch that some of the hyper aggressive Ixalan decks had. I think that’s a good thing. When everyone is doing fair things, it allows for more interesting gameplay decisions. Obviously, nine matches isn’t enough to draw massive conclusions about the format, but right now it seems like a massive improvement over triple-Ixalan. I did get to try out some weird rares this week. Kumena’s Awakening and Path of Mettle impressed. Golden Guardian did not. Whew, this was longer than I thought. Perhaps fewer details next time, especially if I get up to 5 or 6 drafts next week.